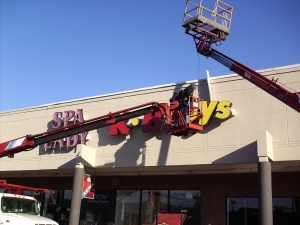 Sign-Express employs years of experience providing sign installation for businesses and organizations nationwide. We have developed a detailed process for sign projects that insures all facets of the job are completed to the desired specification. Stringent attention to zoning code laws and state electrical sign code regulations ensure that your sign installed safely and designed to last the test of time. Poorly designed and installed signs can cost your business or organization. All lighted signs and LED signs are inspected for proper operation, installed accurately and with the right amount of venting to ensure long life. Sing-Express has installed every type of sign you can imagine, we know just how important a working sign is to your location. Contact us for a free consultation on your sign installation needs. Our network of sign installers are all licensed and bonded in their state. We have thousands of sign installations across the United States ranging from small wall mounted signs to large LED billboard installations. No sign install is too small or too large.